The US military has accused the “highest levels” of Iran’s government of supplying increasingly sophisticated roadside bombs to Iraqi insurgents. 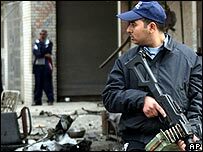 Senior defence officials told reporters in Baghdad that the bombs were being used to deadly effect, killing more than 170 US troops since June 2004. The weapons known as “explosively formed penetrators” (EFPs) are capable of destroying an Abrams tank. US claims the bombs were smuggled from Iran cannot be independently verified. 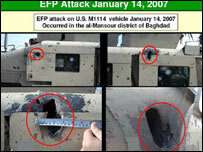 The US officials, speaking off camera on condition of anonymity, said EFPs had also injured more than 620 US personnel since June 2004. They said US intelligence analysts believed the bombs were manufactured in Iran and secretly sent to Iraqi Shia militants on the orders of senior officials in Tehran. “We assess that these activities are coming from the senior levels of the Iranian government,” one official said. He pointed the finger at Iran’s elite al-Quds brigade, a unit of the Revolutionary Guards, saying that a senior commander from the brigade had been one of five Iranians seized by US forces in a raid in the Iraqi town of Irbil in January. The defence official said that when the men were captured they had been tying to flush documents down a toilet and that one of them had been contaminated with explosives residue. They had also reportedly shaved their heads to alter their appearance – bags of their hair were found during the raid. Tehran has denied that the captured Iranians are members of the brigade, which Iran does not officially recognise, but which observers say reports directly to Ayatollah Ali Khamanei. The US officials also referred to a raid in Iraq in December in which the security forces said they found inventory sheets of weaponry and equipment that had been brought into Iraq. The US has claimed in the past that Iranian weapons were being used in Iraq, but it has never before accused Iranian government officials of being directly involved. Tehran has repeatedly denied any involvement. The US officials said that as well as bomb-making technology Iran was supplying Shia groups in Iraq with money and military training. The BBC’s Jane Peel attended the briefing in Baghdad, at which all cameras and recording devices were banned. 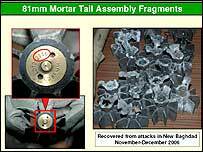 Examples of the allegedly smuggled weapons were put on display, including EFPs, mortar shells and rocket propelled grenades which the US claims can be traced to Iran. “The weapons had characteristics unique to being manufactured in Iran… Iran is the only country in the region that produces these weapons,” an official said. In the latest violence in Iraq , at least 15 people were killed when a suicide bomber drove a vehicle laden with explosives into a police station near the town of Tikrit. 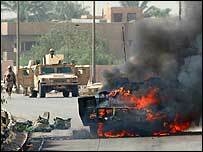 At least 25 people were injured in the attack on the station in Adwar, about 175km (110 miles) north of Baghdad. The casualties are reported to include prisoners held in cells at the police station, as well as civilian visitors. Two US soldiers were killed by small-arms fire in Baghdad and north-east of the capital, the US military said. Separately, the US military said it had no information on a helicopter that residents said came down near the town of near Taji, about 20km (12 miles) north of Baghdad. In October 2005, the then British ambassador to Iraq William Patey told reporters in London that Iran had been supplying technology used to kill British troops in Basra. He said he had complained to the Iranian ambassador in Baghdad about it. The claim was that elements connected to the Shia militia in the south, the Mehdi army, had been using specially shaped charges, in which the force of the explosion is directed narrowly in one direction, thereby enabling it to penetrate armoured vehicles. No evidence was produced, other than a suggestion that the Iranian-supported Lebanese group Hezbollah had also used such charges, so the common origin had to be Iran. US officials have made similar claims over the last year. General George Casey, the then US commander in Iraq, said so in June 2006. In a briefing in Baghdad on Sunday, US military and intelligence officers finally laid out their evidence. The question has to be asked as to why it has taken at least 14 months for this to happen. If you take the claims at face value, the reason is that only now has the evidence become substantial enough to be made public. The number of attacks is said to have grown as well, so that is another explanation put forward for going public now. A trend has been identified about which information should be given. According to this position, there is nothing sinister about the timing of the claim. It is the result of an evidence-based process which has only now reached the stage of producing a result. And after all, reporters have been asking for this evidence for months. For a start, the fear among some is that the US is softening up world opinion for an attack on Iran. Such an attack would be aimed at Iran’s nuclear facilities. At the moment, the US lacks a casus belli and by claiming that Iran is responsible for killing USA troops, it could be laying the groundwork for a ‘self-defence’ justification, according to this theory. There is also the fact that the US is launching its ‘surge’ policy of moving extra troops into Baghdad. These claims are being made against Shia militias, including the Mehdi army, one of the main targets of the latest policy. Blaming Shia Iran for supporting Iraqi Shia militias makes it easier for the US to sell that policy at home and abroad. Then there is the old tactic of blaming someone else for your own problems. Many people will not distinguish between the Shia militias that Iran is said to supply – and which have ties to the Iraqi government – and the Sunni insurgents who have been the cause of much of the violence. The allegedly Iranian supplied bombs are said to have caused the deaths of 170 American soldiers, but overall 2497 soldiers have been killed in hostile incidents, most of them at hands of the Sunnis. The claim serves the purpose of helping to lay the blame for the whole insurgency at Iran’s door. There are also other possible reasons for this timing. The UN Security Council has laid down that Iran must suspend its enrichment of uranium by 21 February. If it does not, and if the International Atomic Energy Agency confirms this, the resolution says that further economic sanctions will be considered. The US is preparing to argue for tougher sanctions, so making claims against Iran over Iraq might help it in its arguments that Iran is a threat. On the wider front, the Bush administration is engaged in a campaign against the Iranian government in order to isolate it and eventually maybe see its end under internal pressure from the Iranian people. The latest claims against Iran could be a part of that campaign. What of the claims themselves? They are based on physical evidence, from bombs and their effects. The bombs now even have their own name and acronym – explosively formed penetrators or EFPs. Previously they had been lumped in the generalised description of IEDs – improvised explosive devices. The implication is that now they are less improvised and more planned. They are said to be provided by Iran in kit form and to be smuggled across the often-open border. However the officials who presented the evidence could not make a direct link to Iran. “The officials said such an assertion was an inference based on general intelligence assessments,” stated the New York Times. They did make much of the detention in Irbil of five Iranians who were said to be members of the Quds force of the Iranian revolutionary Guards. The Quds (the word means Jerusalem) force was said by the US officials to be controlled directly by the “highest levels of the Iranian government”. That last statement is significant in that the US is now making a charge against the Iranian government itself, not just against its agents. Against the inference that this all comes from Iran is the concept that Iraqis themselves would be capable of copying a design and therefore do not need to get bombs from Iran. And there have been a number of news reports over the last year expressing scepticism, even among military personnel, about the link to Iran. The Washington Post reported last October that British troops in the south doubted the claim. A year ago, the London Times said that British officers in Basra had stopped making any such claim, saying only that the technology matched bomb-making found elsewhere in the Middle East, including Lebanon and Syria. Posted on February 12, 2007 February 12, 2007 Author adminCategories Media / NewsLeave a comment on US claims against Iran: why now? The UN nuclear watchdog, the IAEA, says it has frozen almost half its technical aid projects involving Iran. The IAEA says its move is to comply with UN sanctions imposed on Tehran late last year over its refusal to halt uranium enrichment. Twenty-two projects have been suspended, according to an IAEA report. Iran’s chief nuclear negotiator, Ali Larijani, is to meet EU diplomats at a forum in Germany on Saturday, despite earlier reports to the contrary. European officials hope to hold informal talks with him on the nuclear stand-off at the top-level security conference in Munich. The IAEA gives technical aid to dozens of countries on the peaceful use of nuclear energy in fields such as medicine, agriculture and power generation. The nuclear watchdog has 55 projects that involve Iran. Of these, 22 have now been frozen to comply with the UN sanctions, which call for an end to programmes that could be exploited by Iran to develop nuclear weapons. The IAEA board is expected to formally back the move, recommended by IAEA chief Mohamed ElBaradei, when it meets next month. The BBC’s Kerry Skyring in Vienna says that the IAEA has been under pressure from the United States to take a tough line. A senior UN official told Reuters news agency the freeze constituted a “substantial cut” in technical aid to Iran. “It is a message of inducement to Iran to reconsider its course,” the official said. The US believes that Iran is working to develop nuclear weapons. Iran says its nuclear programme is for peaceful purposes and has vowed to continue.